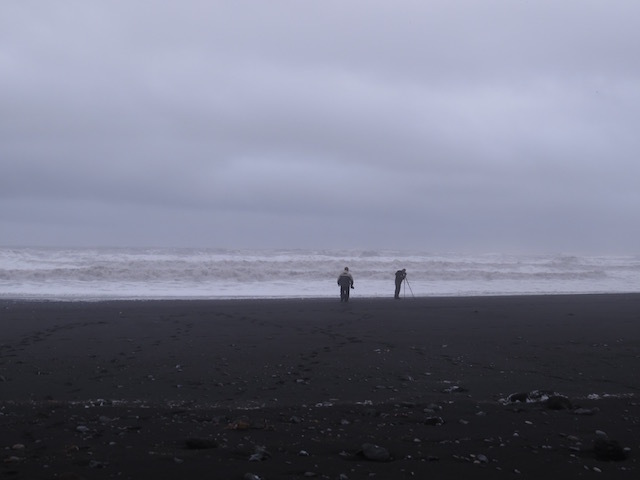 Dave and I spent part of a morning walking the Black Sand Beach near Vik in Iceland. 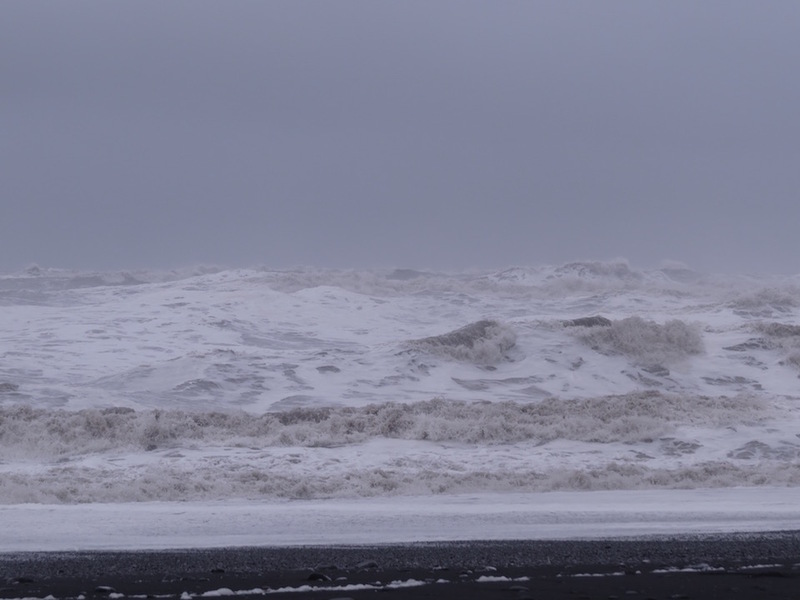 The waves on the ocean were huge, like giant icy mountains. 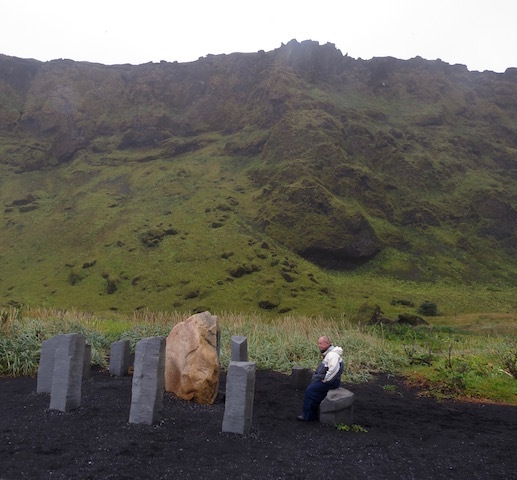 The angry waves made it easy to understand why there are monuments at different places along the beach that honor sailors who have died on the shores of Iceland, like this one where Dave is sitting. The wind was crazy and it took away a lens cover that this photographer was using. 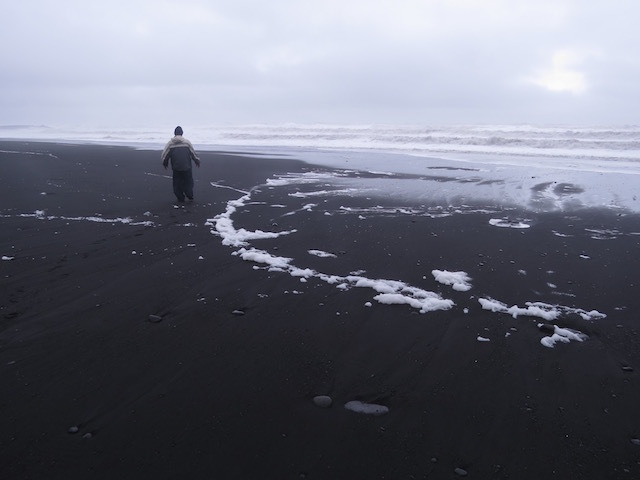 Dave went running after the lens cap chasing it for a long way up the beach. 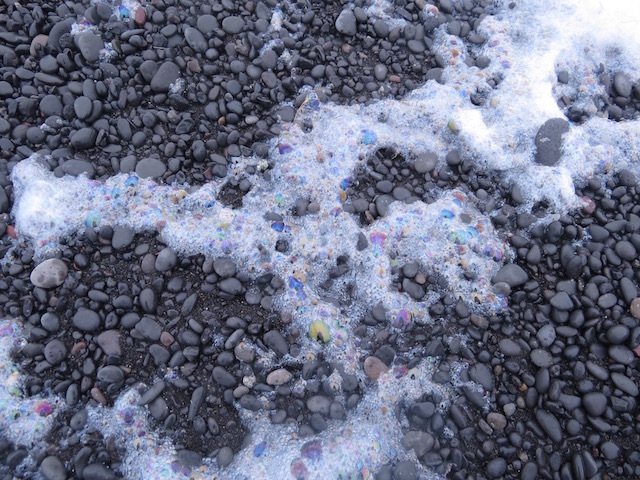 The giant waves left trails of foam along the shore that painted a kind of artwork in the black sand. 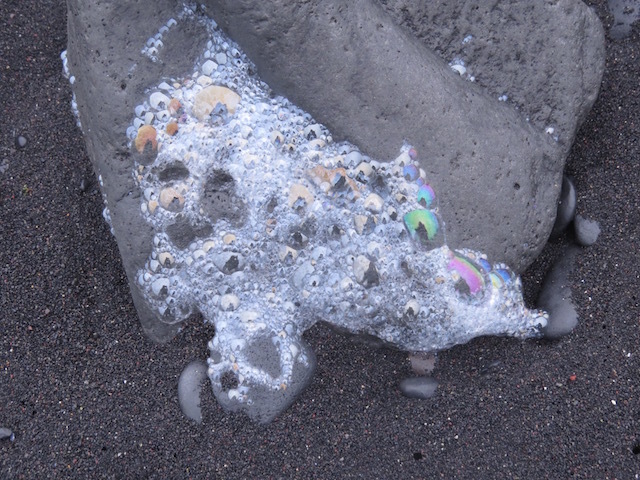 Some of the foam caught on stones and the sunlight made the bubbles in the foam look like jewels. 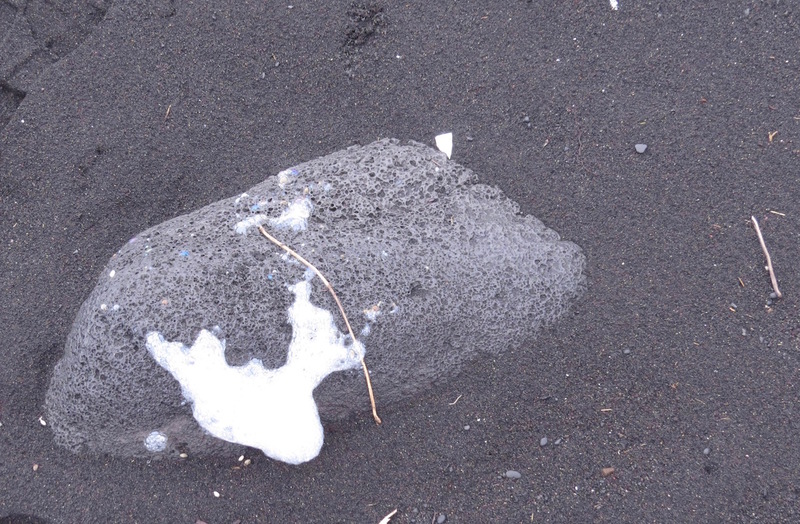 I thought this bit of foam caught on a rock looked a bit like the outline of Iceland. 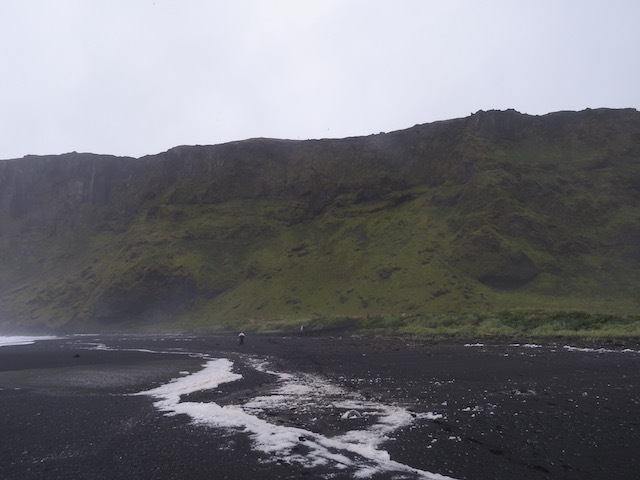 We are here in what they call ‘shoulder season’ right at the very end of the best weather in Iceland. 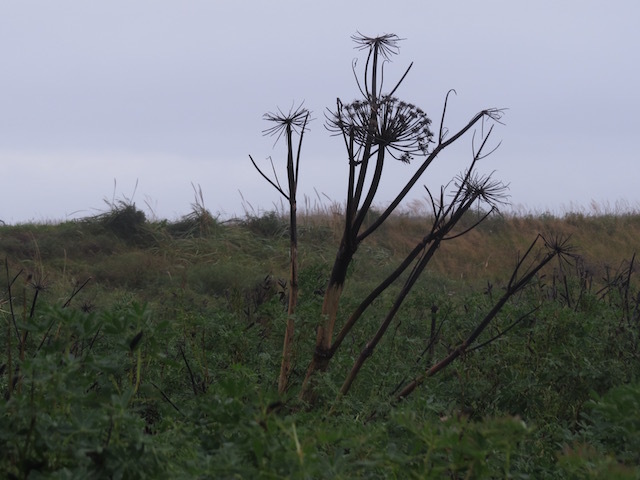 But there is a haunting beauty to grasses and fungi that show their color in fall. 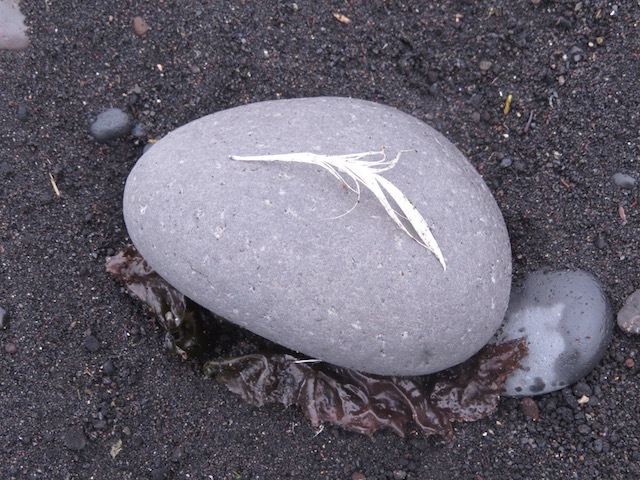 The waves on the Black Sand Beach had also washed this lone feather up onto a rock. 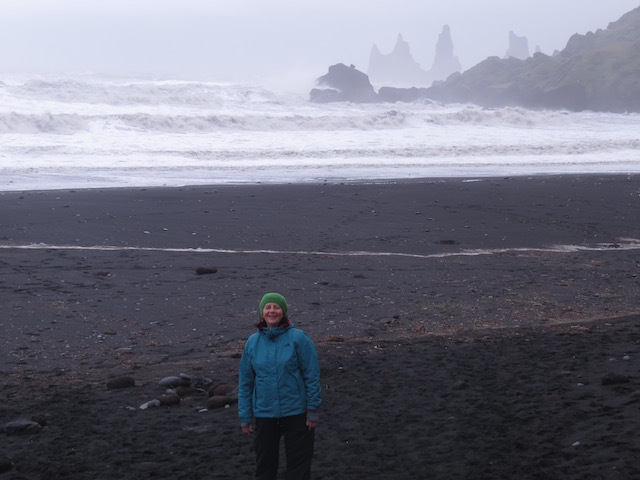 On the black sand beach are these three basalt columns called the Reynisdrangar. Legend says the rocks are really three trolls caught out too late at night and frozen by the early morning sunlight. 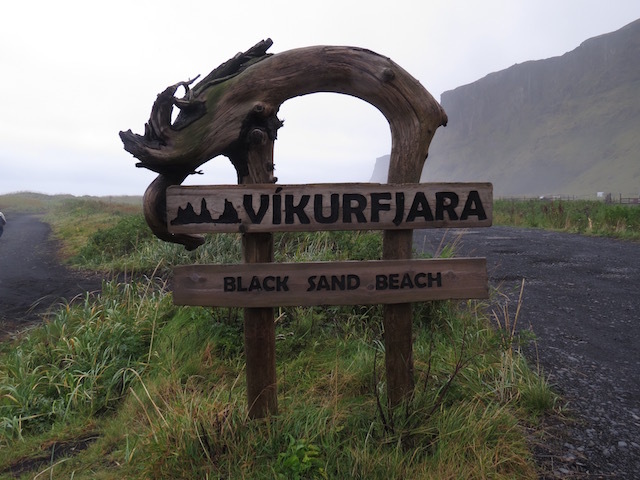 Iceland is a place of spectacular beauty in the fall and the Black Sand Beach shows off that beauty at its best. 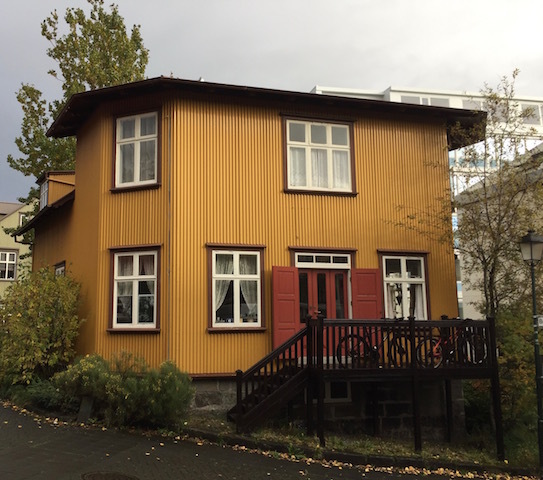 Why are the older homes painted so colorfully in Reykjavik? 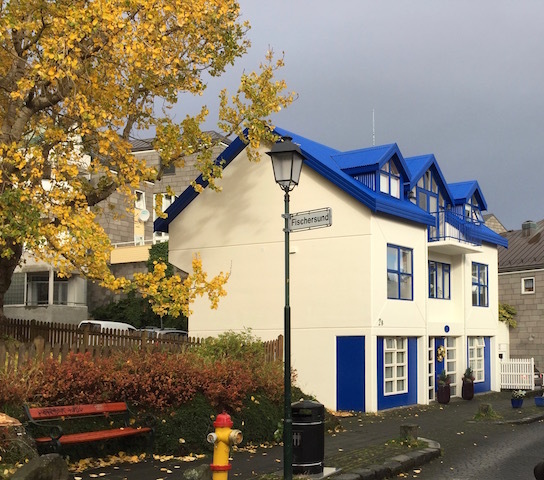 On a walking tour of the city we were told that painting your house in bright colors is a way to bring cheerfulness to the long dark days of winter in Iceland. 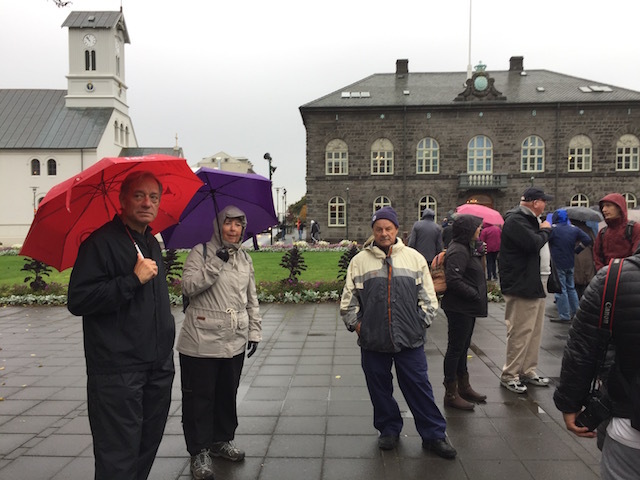 Our last day in Reykjavik was rainy but that didn’t stop a crowd of about thirty people from meeting in the square across from the Icelandic Parliament buildings for a city walking tour that runs many times daily. Tomas was our interesting and humourous guide. He was born and grew up in Reykjavik but his father is from Chicago. Here Dave asks him about the annual music festival in Iceland. Our son’s band performed in that festival several years ago. 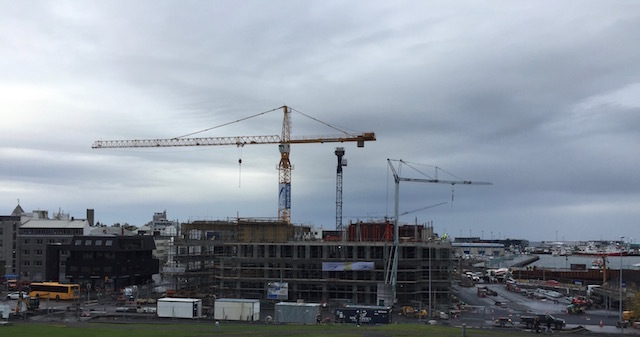 There is lots of construction going on in Reykjavik. Here a large hotel is being built. 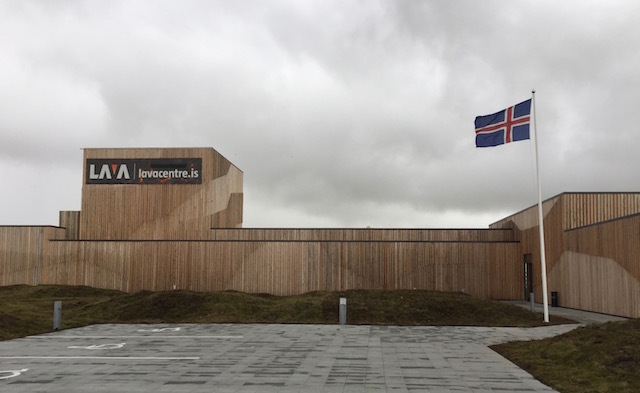 The tourist industry in Iceland is responsible for much of the new construction. 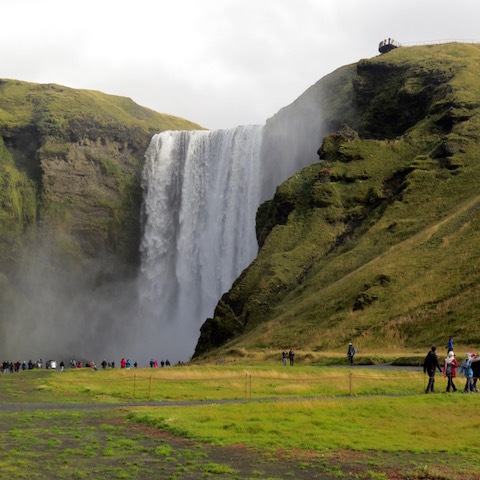 In 2000 there were 300,000 visitors to Iceland, the same as the number of people who live there. In 2017 some 2.4 million tourists will visit. 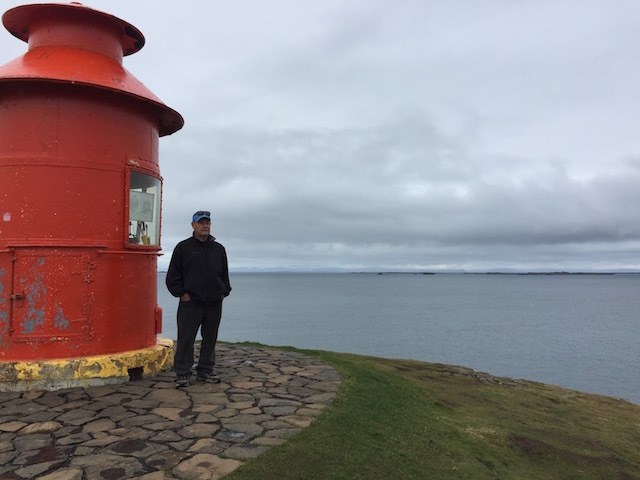 Tomas said Icelandic citizens have mixed feelings about the tourists. They are happy for the income they add to the economy but question how all those visitors and the infrastructure needed to service them is changing their country. 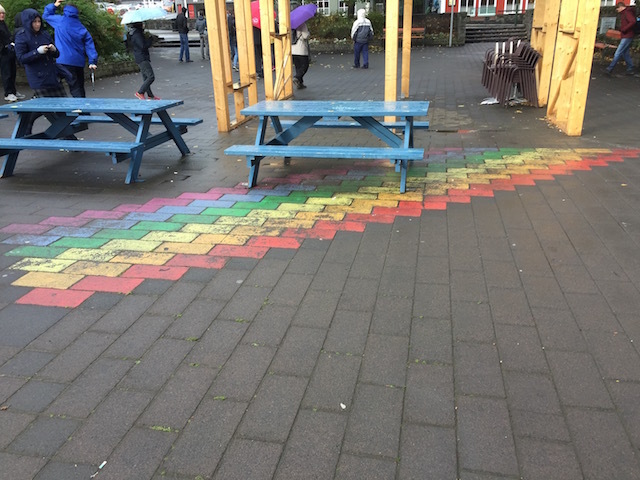 Gay Pride is the biggest festival in Reykjavik. Thomas says his company gives tours 364 days a year, but not the day of the Gay Pride parade in August. 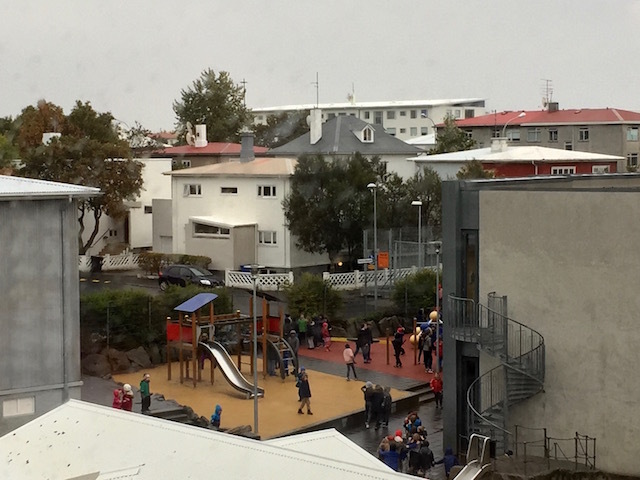 There are simply too many people in downtown Reykjavik celebrating to make that feasible. This etching commemorates the adoption of Christianity as the national religion of Iceland in the year 1000. 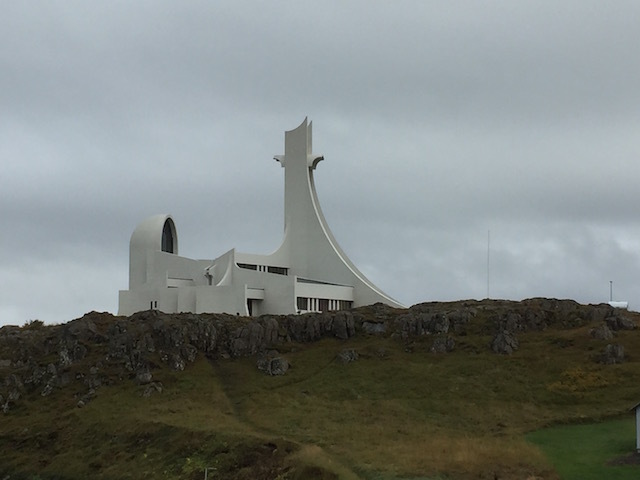 Today the state pays 140 Christian ministers even though only 10% of Icelanders go to church at least once a month and nearly 50% never attend church. 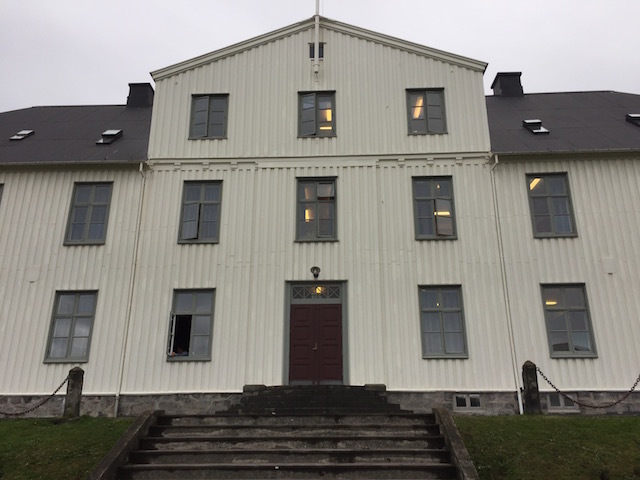 This is a highschool in Reykjavik. Do you notice the open windows on the school even though it is a cold day? 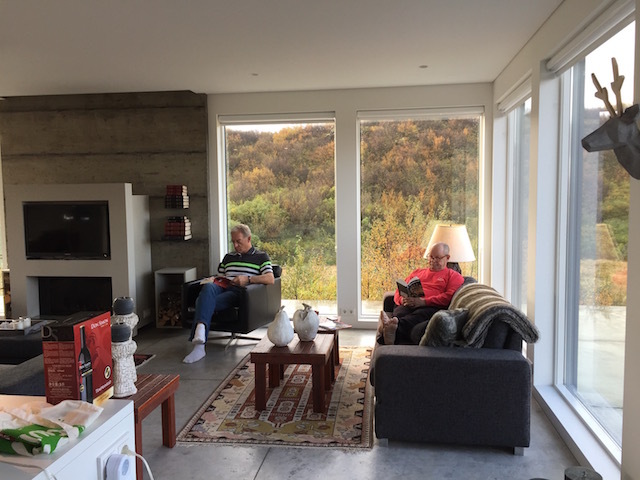 Central heating in Iceland is geo-thermal and is so effective and cheap that buildings often get too hot and windows need to opened to moderate the temperature. This elementary school was right across the street from our apartment. 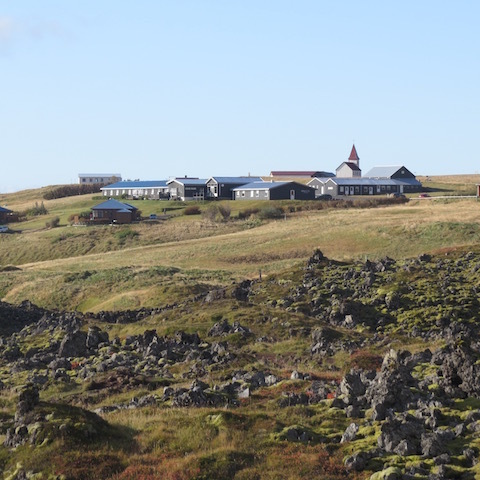 The government pays for all education in Iceland from nursery school through university. I was surprised that despite the cold rainy weather the children seemed to spend a good part of their day outdoors. 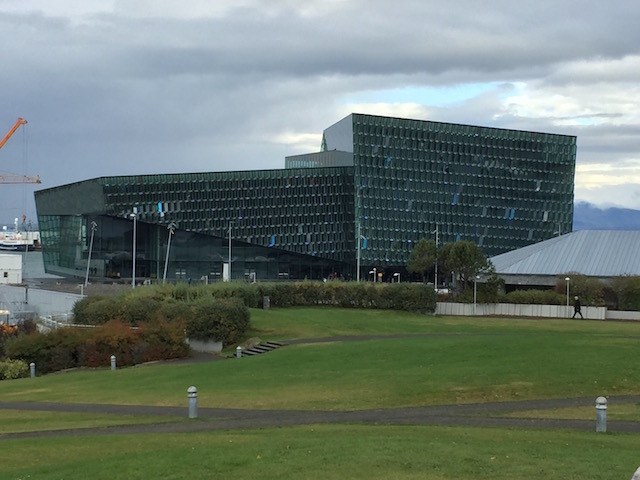 The concert hall in Reykjavik called Harpa is very distinctive. 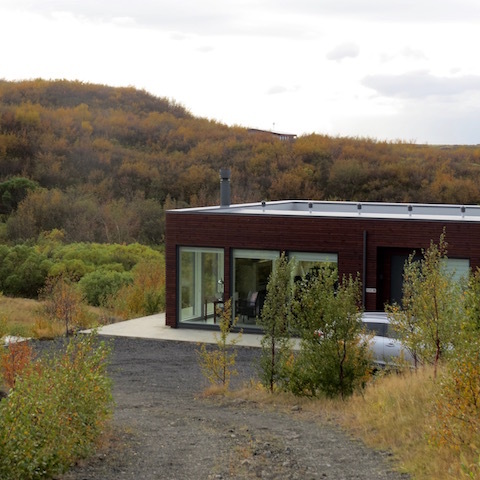 The glass exterior is inspired by the basalt landscape of Iceland. 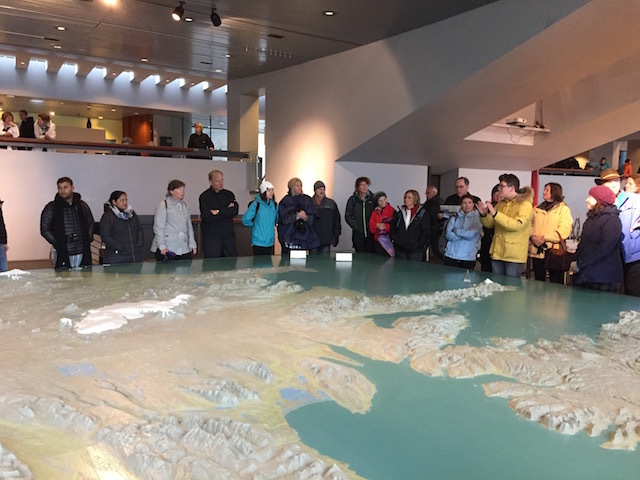 In the Reykjavik tourist information centre we gathered around a large map of Iceland to learn more about its geography and geological make-up. 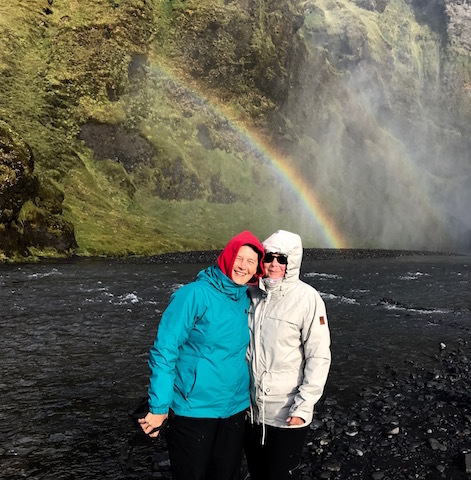 Since we were at the end of our week in Iceland it was interesting to hear Tomas talk about many of the places we had visited. 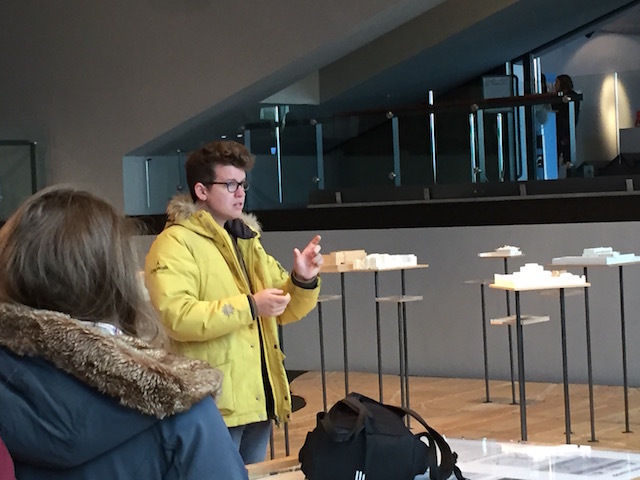 Tomas ended the tour by talking to us about the fact that everyone in Iceland is related. All 300,000 people are part of the same family tree. 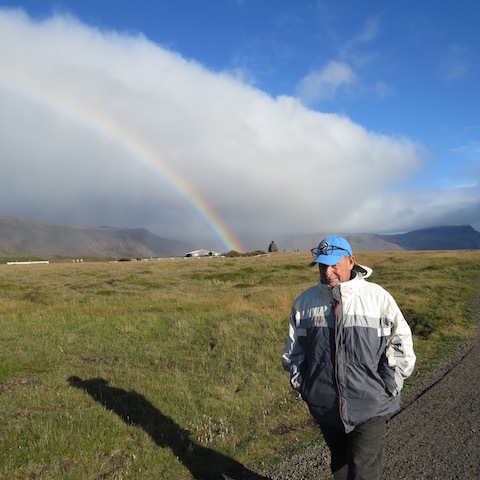 There is a website Icelanders can go to and by typing in their name and social security number they can find out all about their family tree. There is even an app that allows two people to find out how they are related. 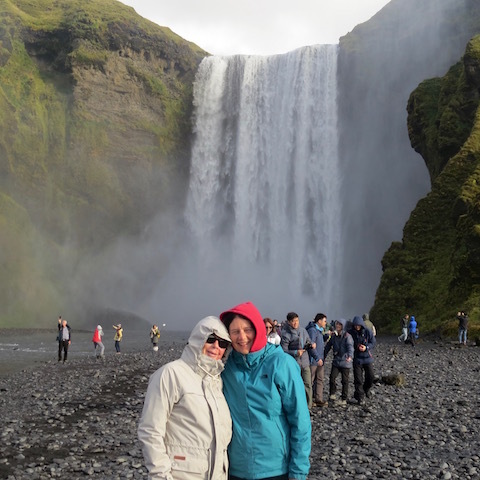 Tomas says in Iceland many people do that after the first date or even the first dance to see if their kinship is distant enough to continue the relationship. Tomas recommended that instead of going to the expensive touristy geo-thermal pools around Reykjavik we just go to one of the geo thermal pools located in almost every neighbourhood. They are cheap and you get to enjoy the steam and heat with local workers, students and families relaxing and socializing there. We took his advice and did that at a pool a short walking distance from the apartment we had rented. It was great. Just as Tomas warned however we had to strip naked and shower communally with others before going in the pool. Colorful posters in the showers illustrated all the parts of your body you needed to soap throughly. You did put your swim suit on to go into the pool though. 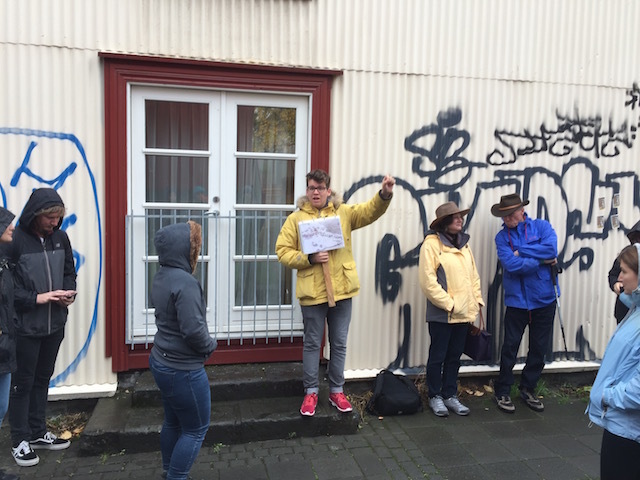 Tomas and his friends do free walking tours of Reykjavik year round. At the end of the tour you can pay the guide whatever you thought the tour was worth. 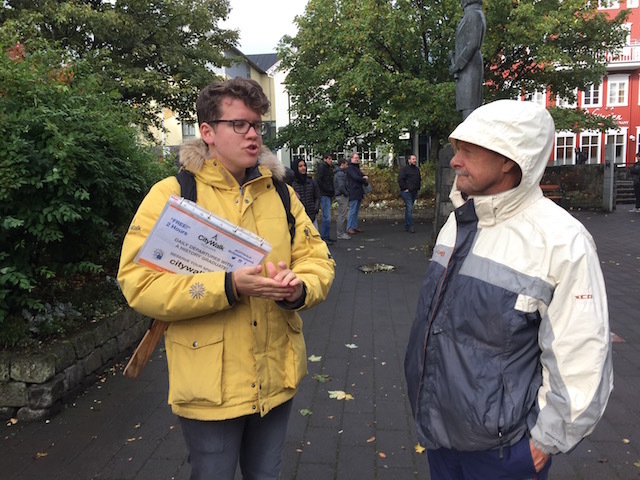 Tomas gave us lots of good tips about what to do in Reykjavik, where to shop and where to eat. 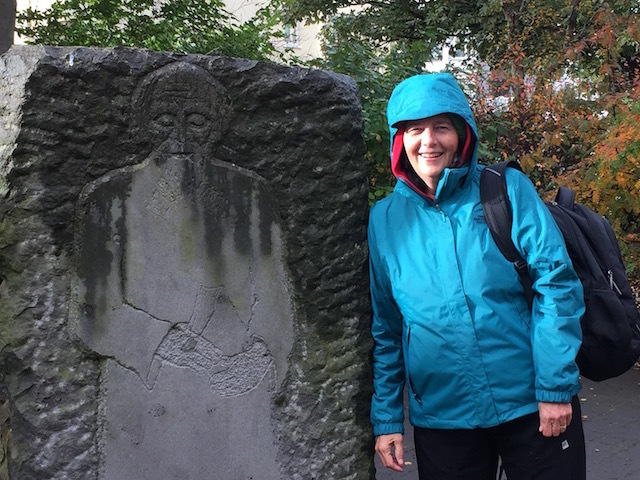 Dave and I have done these free walking tours in other cities and have always found them to be of good value. 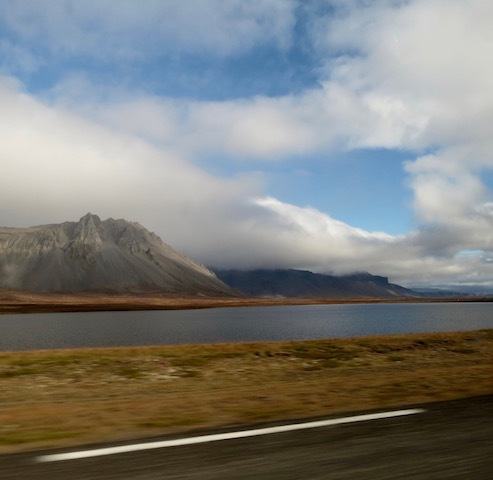 We drove to Reykjavik which will be our final destination in Iceland. On the trip there we were once again blown away by the beauty and diversity of the landscape around us. I took this photo out the car window. We did stop to take this photo of sheep. 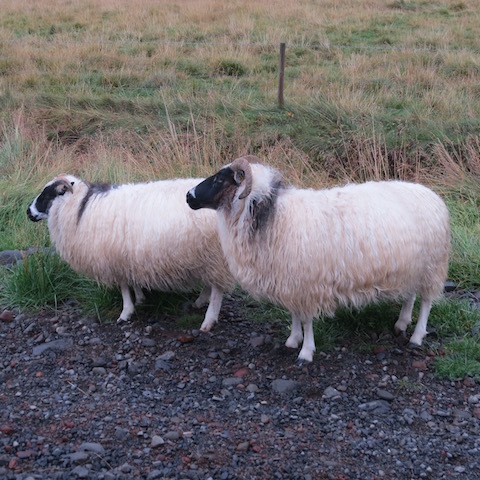 You see sheep just about everywhere you drive in Iceland, sometimes even on the road. I marveled many times at how sure- footed the animals were. It was amazing how very high up on a mountain side they could go to graze. We also stopped to take this photo of horses. 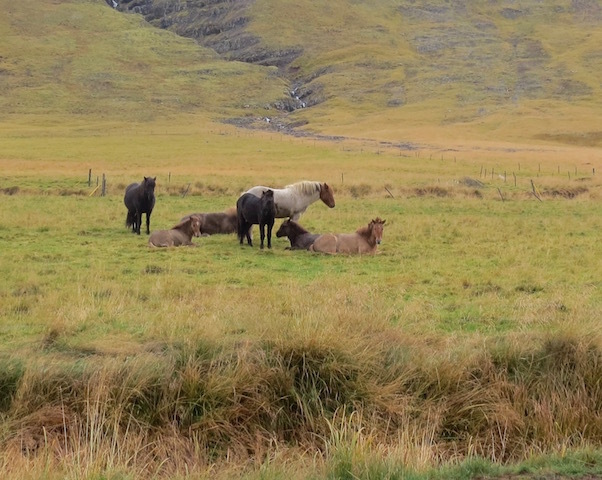 There are so many herds of horses everywhere in Iceland. The friendly, sturdy breed is exported to many European countries. In Iceland they are used for riding and racing and rounding up sheep. 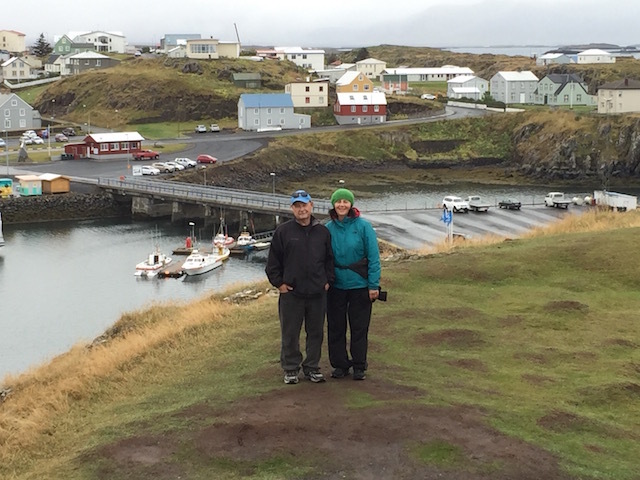 We stopped in the village of Arnarstapi to do a hike to Hellnar village and back. We walked with the ocean on one side and the mountains on the other. 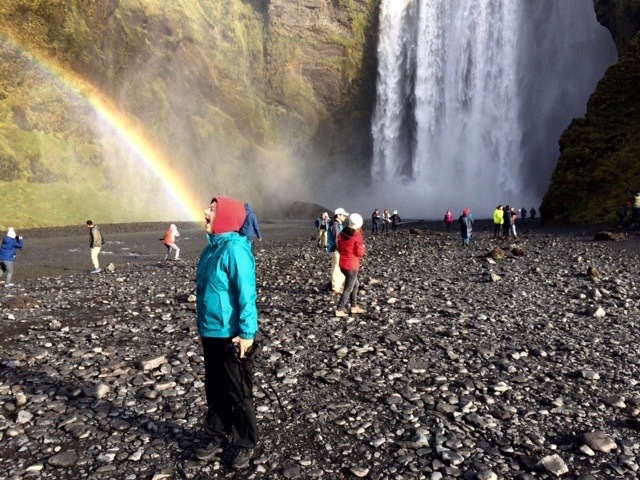 A rainbow followed us all along the way. 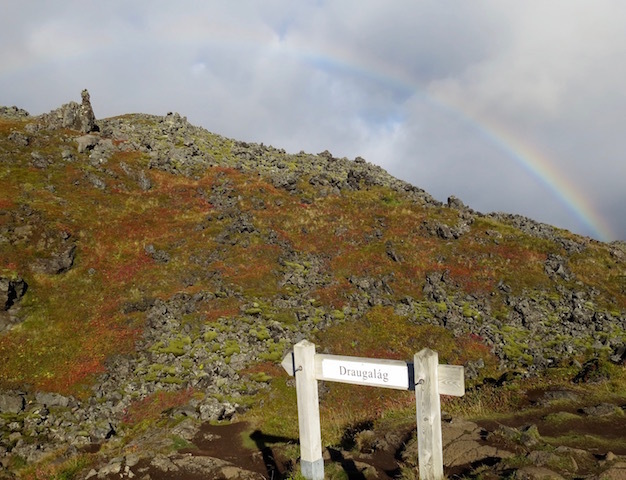 At the start of this hiking path was a statue representing a character from one of the Icelandic sagas or mythical stories. 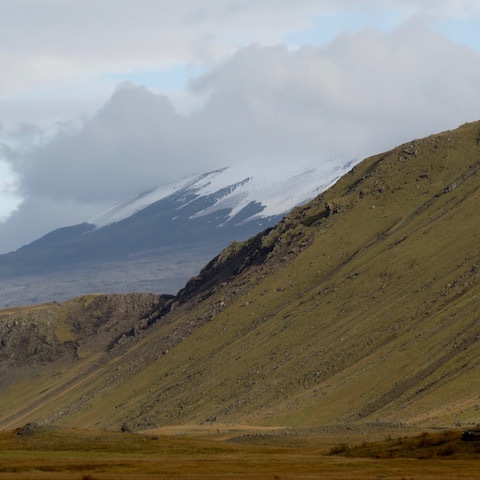 The giant Bárðr Snæfellsáss disappeared into the nearby volcano after a huge family conflict. 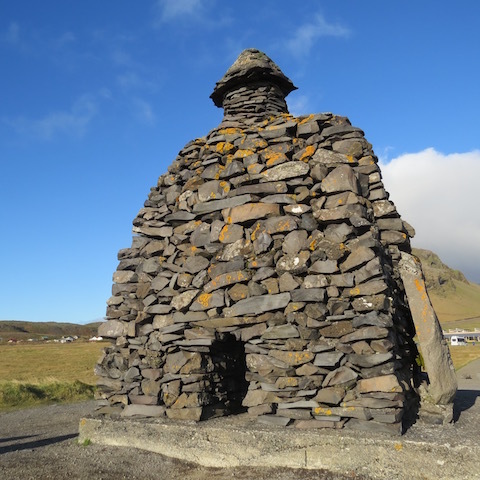 Early fragments of Bárðr’s story have been found in manuscripts dating from the 1400s. We were hiking amongst these lava rocks formed in all kinds of weird shapes and contorted forms. Some rocks were covered with a red kind of lichen. 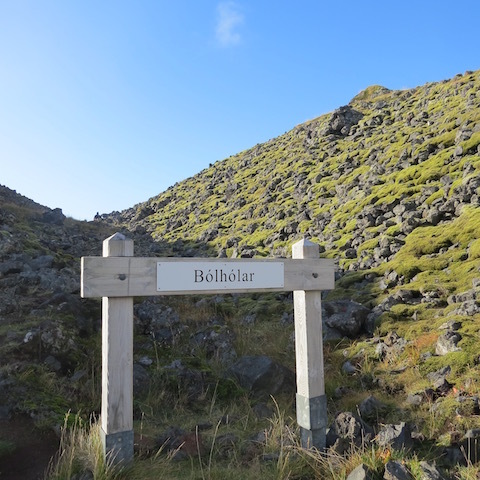 We passed two signs like this one for Drougalag but didn’t know what they were for, although my sister did find a video online of some children from Iceland singing a song about Drougalag who appeared to be some kind of a ghost. We wondered if the signs marked a spot where Huldufolk or elves are thought to live. 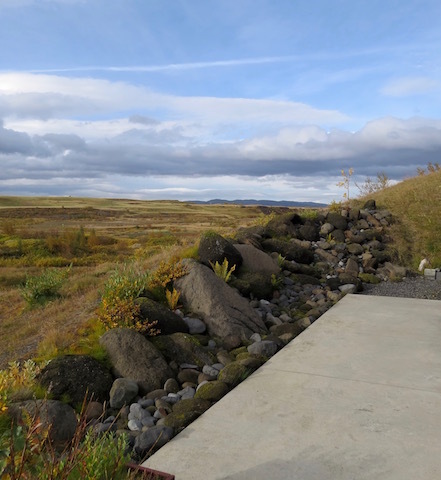 Some people in Iceland still believe in the existence of elves and construction projects can be altered or warnings displayed to protect elf domains. 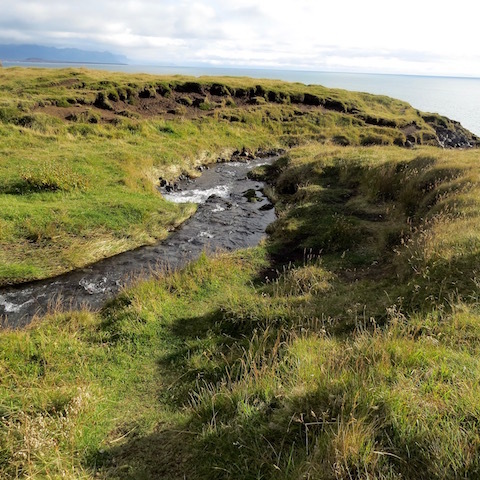 Our path led to the village of Hellnar an old fishing port that dates back to 1560. 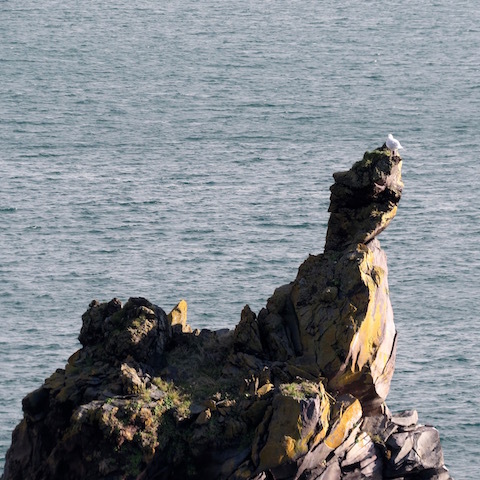 We’d hoped to see some puffins on our hike but all we found were gulls and terns. 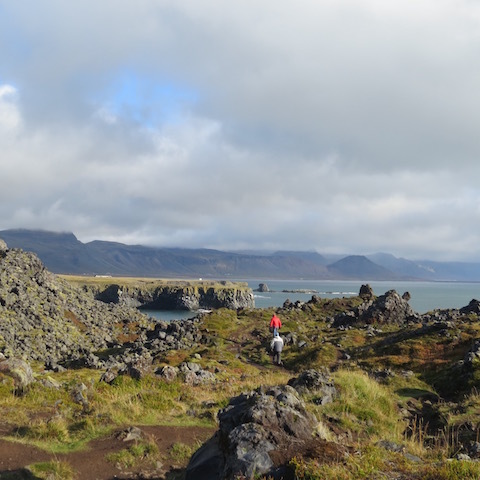 Snæfellsjökull the volcano that was always in view as we hiked is famous because of the novel Journey to the Center of the Earth by Jules Verne. 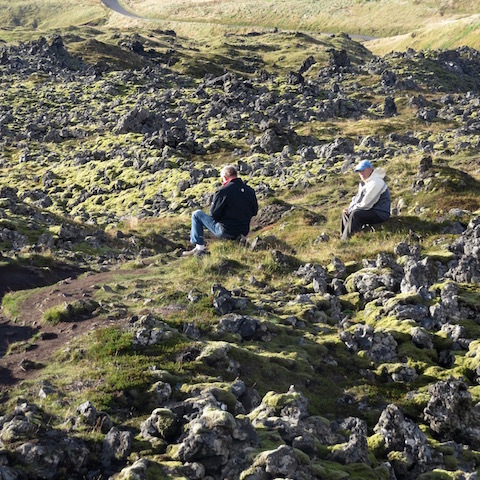 In his book the protagonists find the entrance to the passage leading to the centre of the earth on Snæfellsjökull. 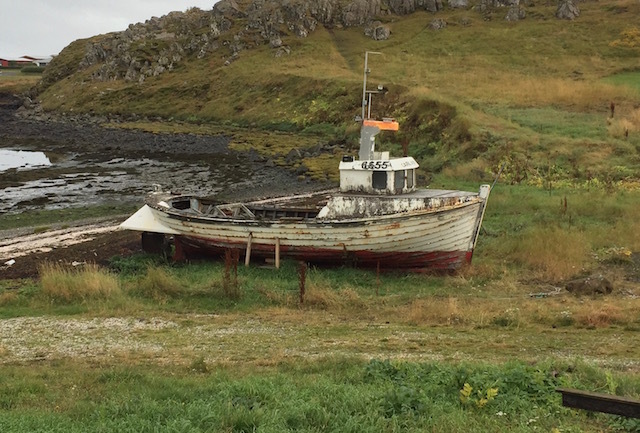 My other posts about Iceland can be found here……..
We spent a night in the fishing community of Stykkishólmur in Iceland. This was our cute and cozy house. 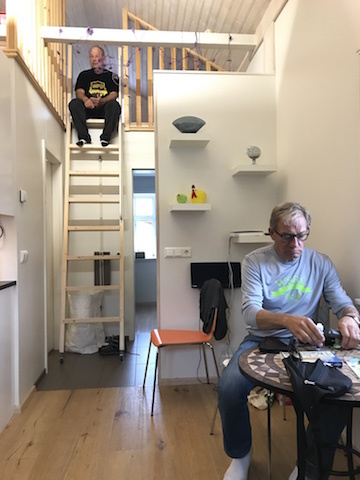 Dave and I had to climb a ladder up to the loft to sleep. The ceiling was so low we could barely stand up there. Each of us had a single mattress tucked under the eaves. 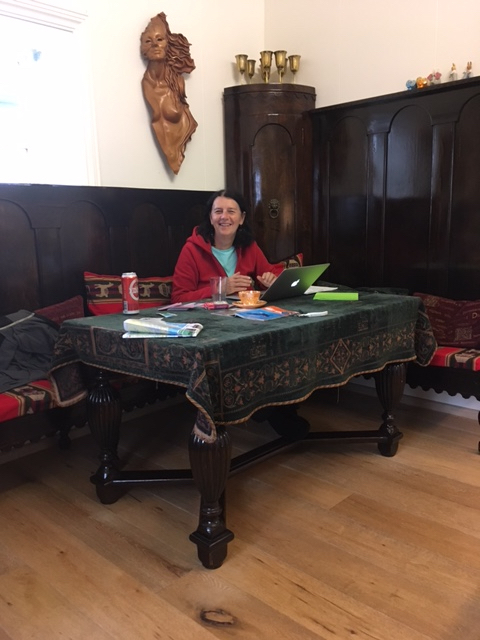 The main living area had this old table and chest with benches that looked like they had come from an ancient church. 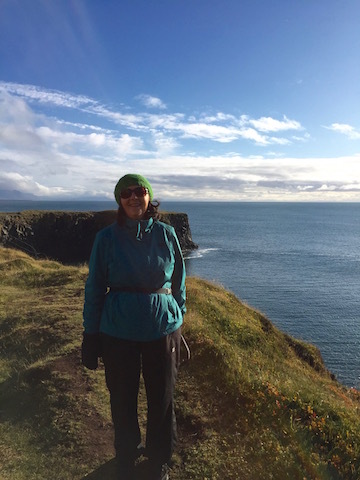 We went for a hike after we arrived. 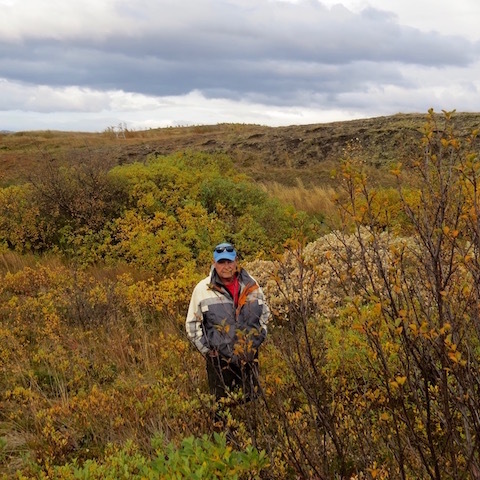 Dave has learned to use the panorama effect on my phone now ……. so he has been experimenting with his new technique. 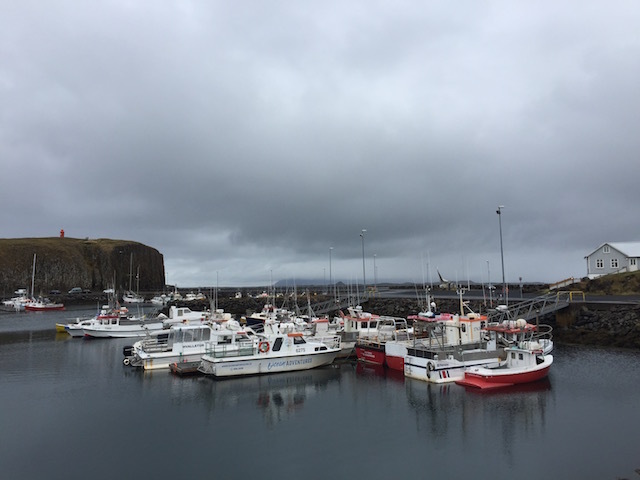 Stykkishólmur had been a fishing harbour since the Middle Ages. and you can see old things in the town like this abandoned boat and…… new things like this beautiful modern church which is also used for musical concerts because of its great acoustics. 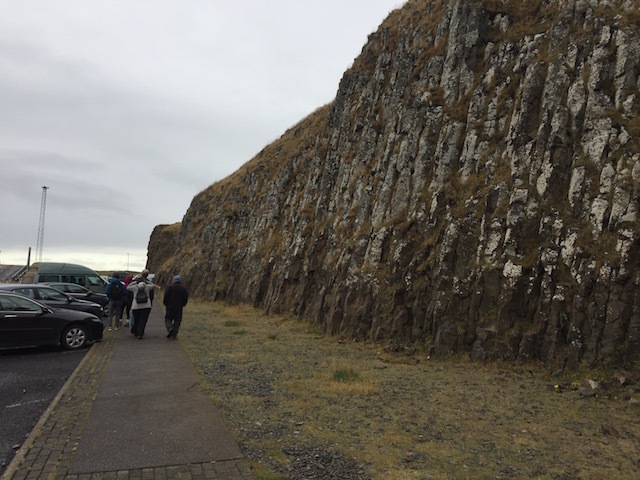 Information panels on our walk provided us with insight into the history of Stykkishólmur and explained that this interesting rock wall was columnar basalt. 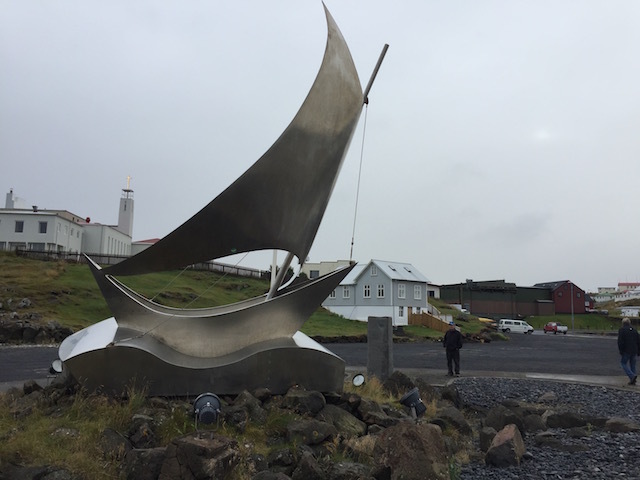 We hiked up to the Stykkishólmur lighthouse and stopped to admire this steel sailboat sculpture near the harbor. 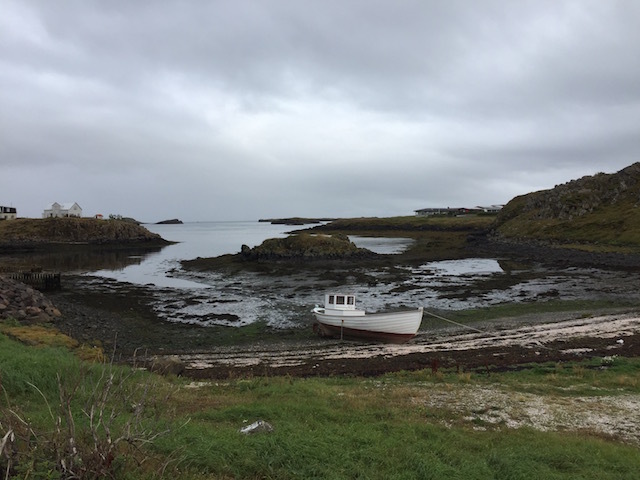 Stykkishólmur reminded me of some of the fishing communities we visited in Newfoundland and Prince Edward Island. 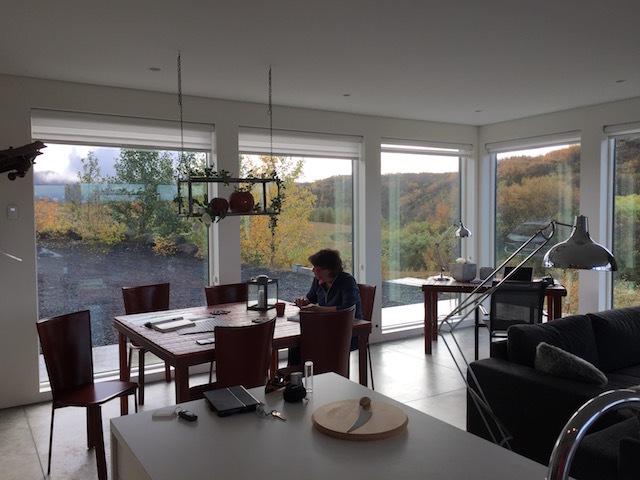 We rented a home near Selfoss in Iceland. 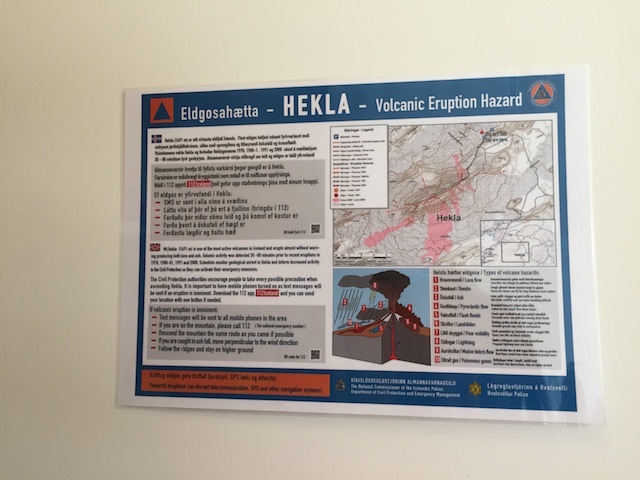 When the owners were showing us around the place they pointed out this poster that explained what we should do if……… Hekla the nearby volcano should begin to erupt. 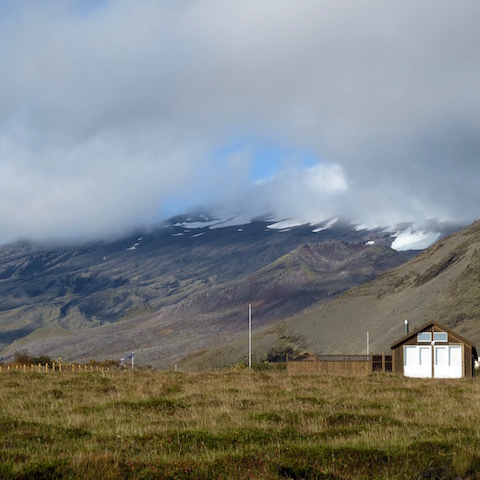 Hekla is one of Iceland’s most active volcanoes. 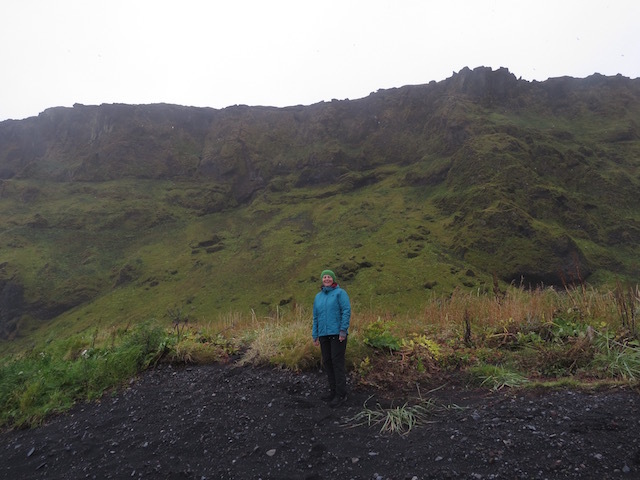 It last erupted in 2000. 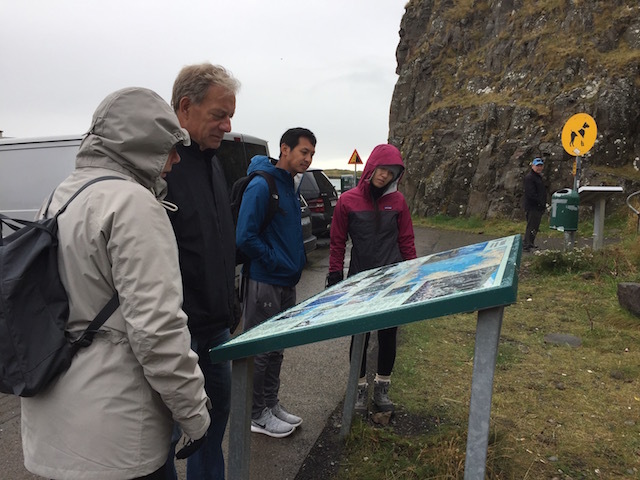 On a rainy day we decided to visit the LAVA museum in nearby Hvolsvöllur to learn more about volcanoes. 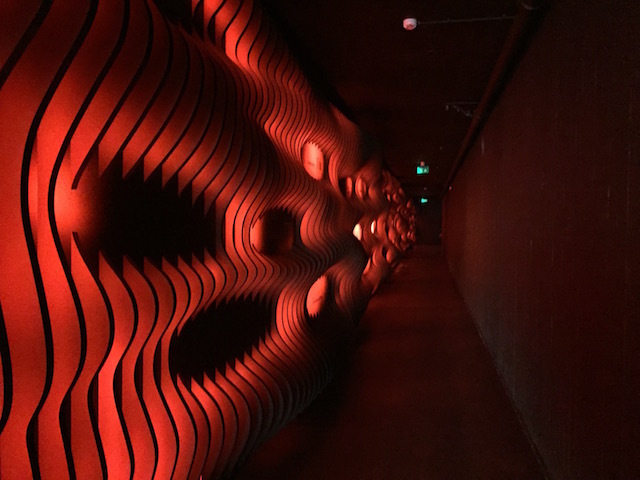 After watching a movie that showed the most recent eruptions of Icelandic volcanoes we walked down this eerie hallway…….. that had panels of information about each of the most active volcanoes in the country. 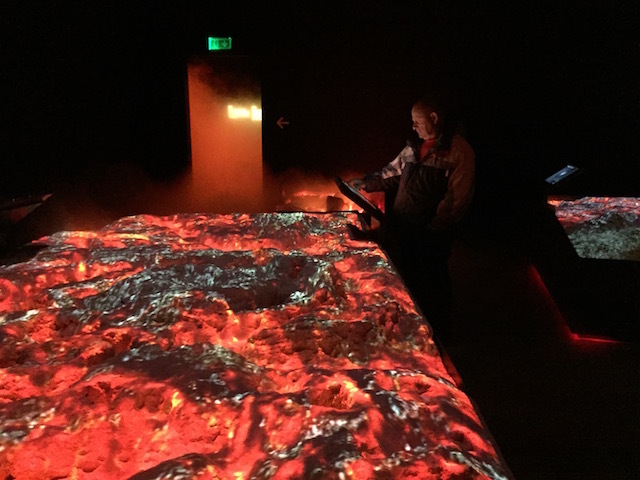 As you go through the museum they try to recreate volcanic effects by having the floor move and divide beneath your feet and having you find your way through a corridor of dense steam. 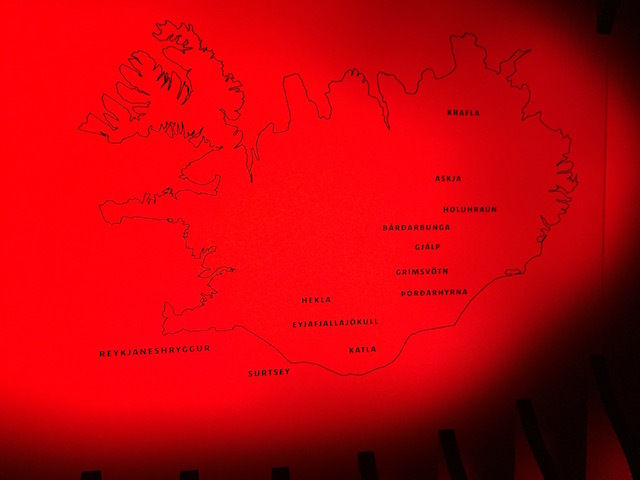 By turning the wheel on this map of Iceland we could see how the various volcanoes had developed and changed. 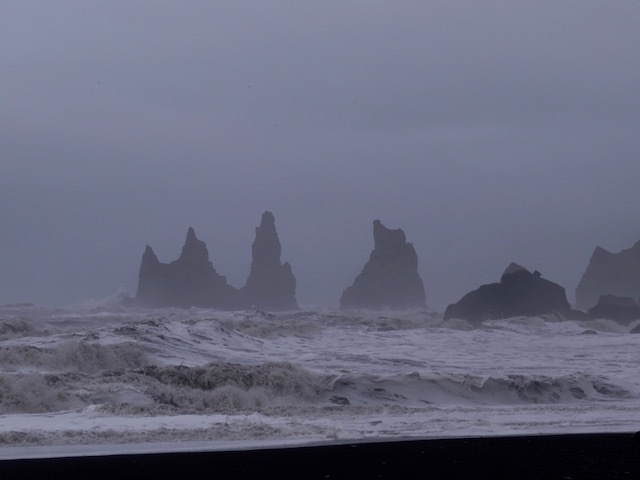 Iceland has some thirty active volcano systems, thirteen of which have erupted since humans settled on the island. 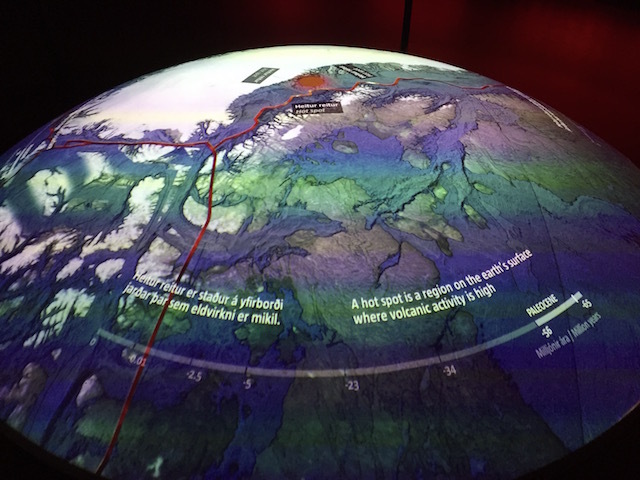 In this room interactive screens helped us learn about different kinds of volcanic eruptions and their effects. 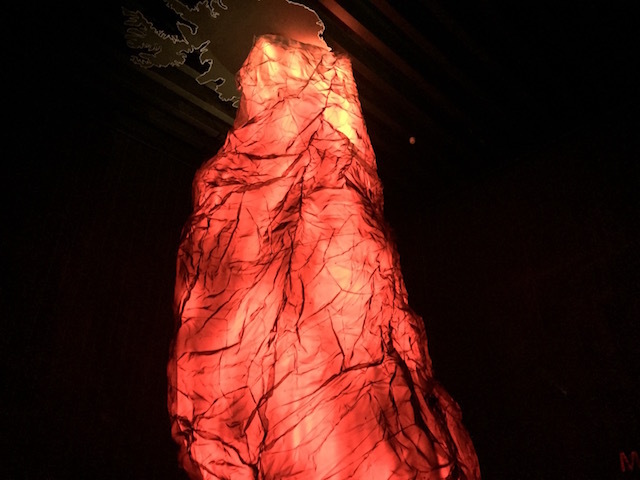 In one area you could look up and down at this gigantic recreation of the mantle plume beneath Iceland’s crust. 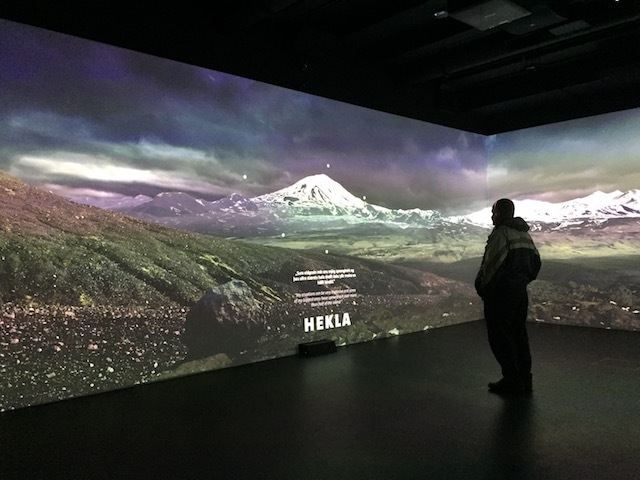 Here screens that surround you recreate the visual effect of a volcanic eruption. 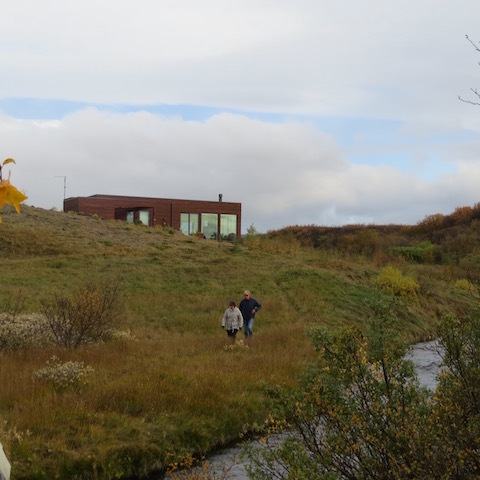 Dave is looking at information about the Hekla volcano nearest the house where we were staying. 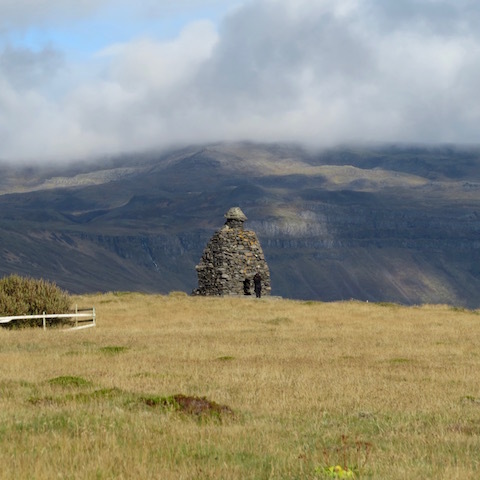 In medieval times people called the Hekla volcano The Gates of Hell. 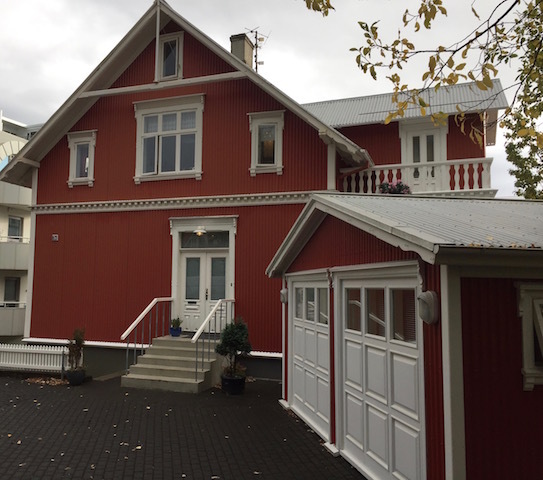 We stayed in this unique and lovely home near Selfoss in Iceland. Spacious and sleekly designed it looked out over the surrounding countryside. 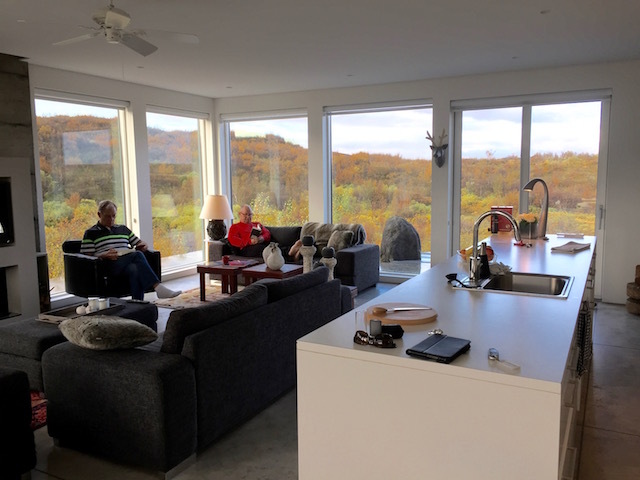 Windows instead of walls encompassed the main living space and offered a stunning view of the fall colors on the hillsides and in the ravines all round. 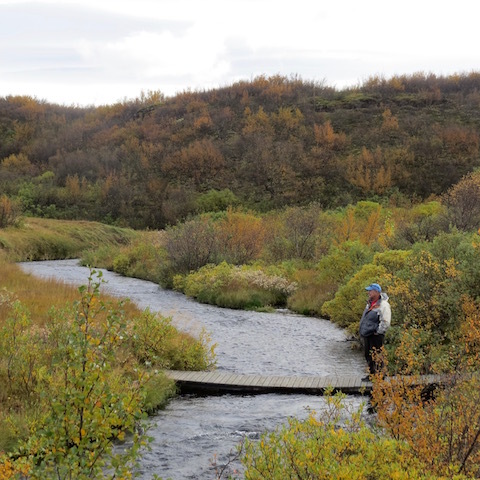 There was a river running behind the house and you only needed to hike a short way to get a spectacular view of Mount Hekla, an active volcano. 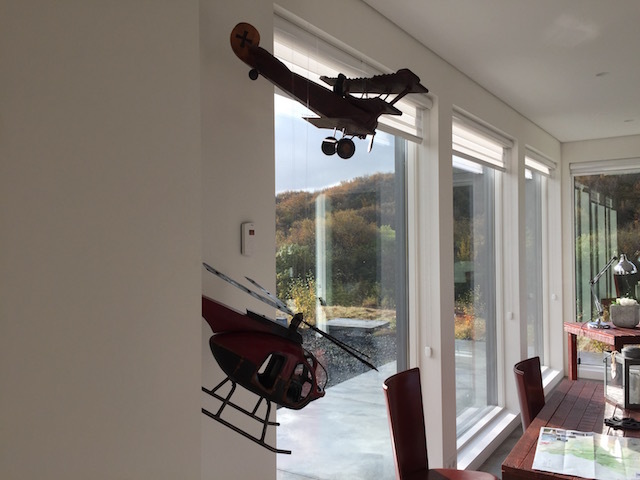 Designed and built by seventy-five year old couple Greta and Pall, the home sat on a huge tract of land purchased by retired Icelandic pilots, each of whom had built a home in the area that featured a grass runway and an airplane hanger. 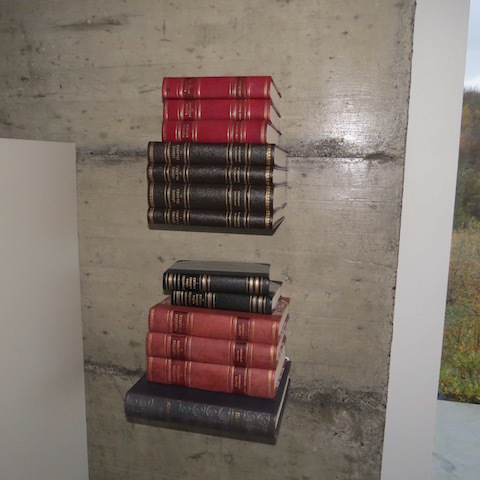 Pall’s hobby is binding books and he had some of his volumes on display on one side of the fireplace. 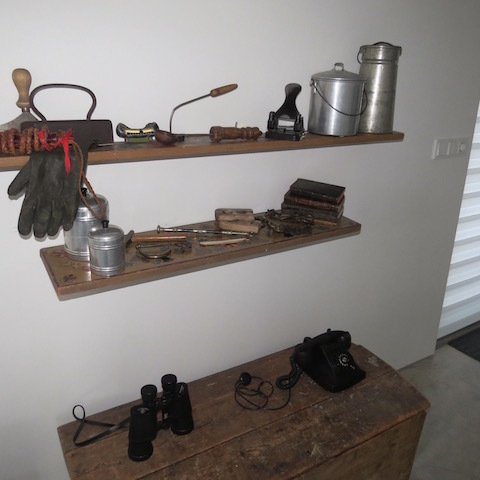 Greta has an affection for antiques and had arranged her unique finds throughout the house. 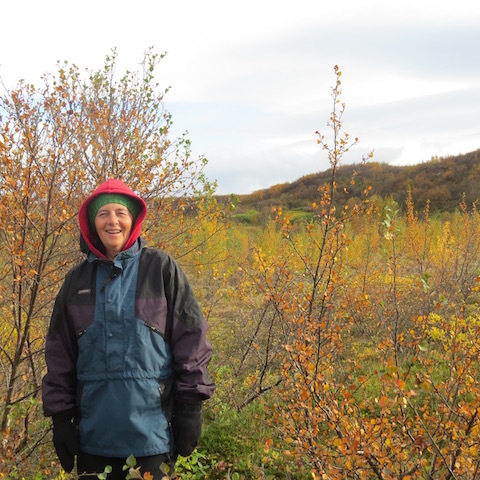 We went hiking in the gorgeous fall colors that abound in this part of Iceland. 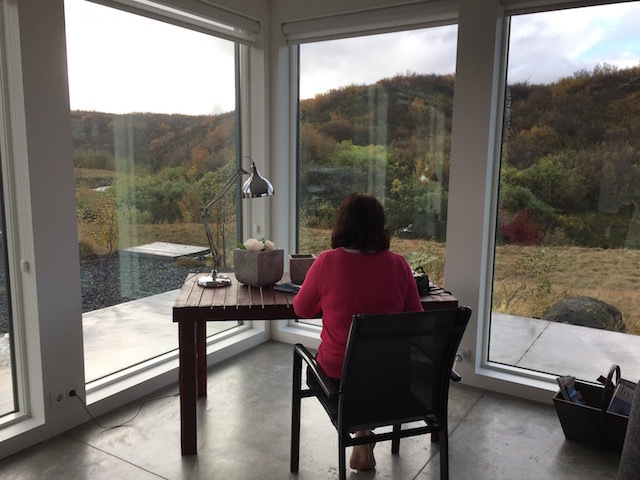 I took over this delightful corner nook for writing and made progress on a manuscript which is due in November. 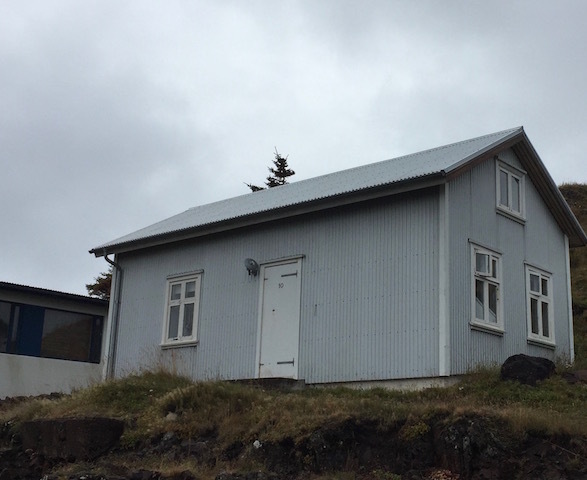 If I was ever lucky enough to snag a writing grant I’d rent this house in Iceland in a heartbeat. 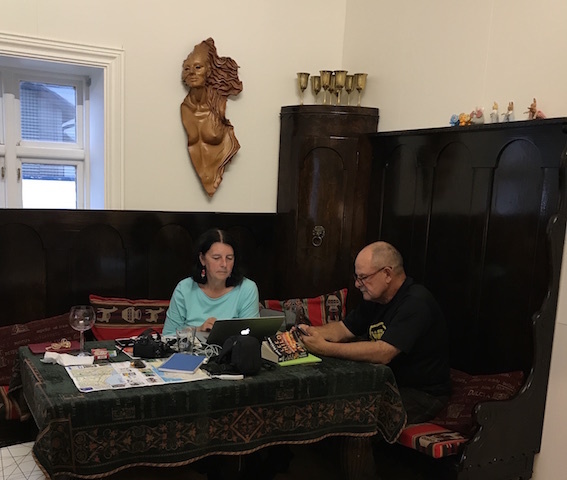 Isolated, but with all the amenities, including great wifi, it would be the perfect place to write. We knew we wouldn’t be near a grocery store so we stocked up before coming here and prepared our meals in the sleek and modern kitchen. 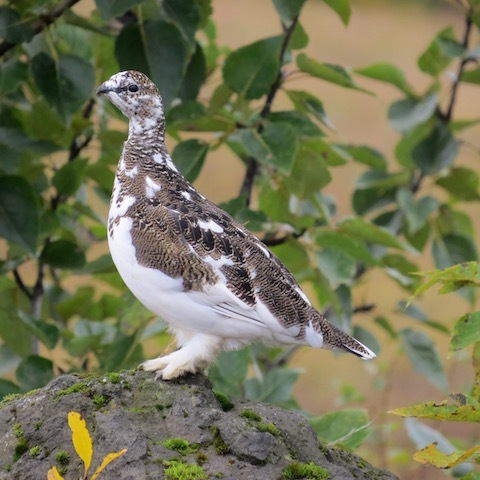 We spotted these rock ptarmigans on the yard. 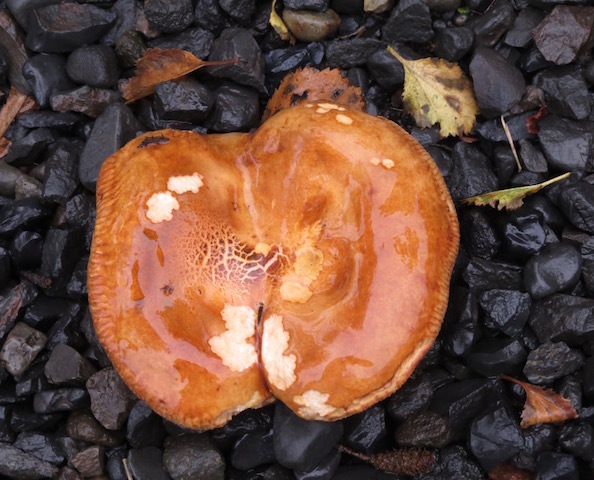 They are a protected species in Iceland. This one is just changing from its summer brown to its winter white. There was a great view from the backyard patio where we barbequed and waited in vain to see the Northern Lights. 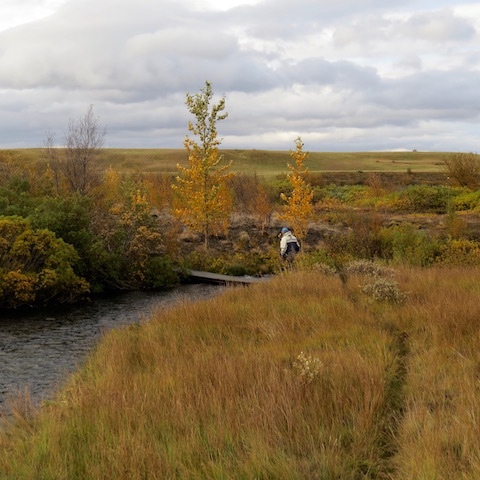 The beauty of the place was a balm for the soul and spirit. 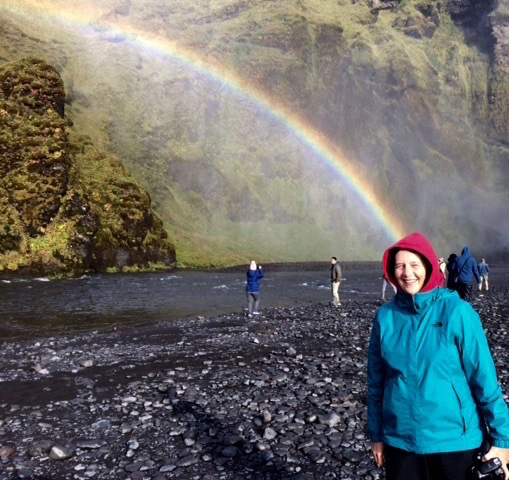 Sometimes in order to get my husband to take photos of me like this I have to keep him happy by staging silly pictures, like this one he insisted I pose for at Skógafoss one of the biggest and most beautiful waterfalls in Iceland. In return however he took some lovely photos of my sister Kaaren and me at the falls. 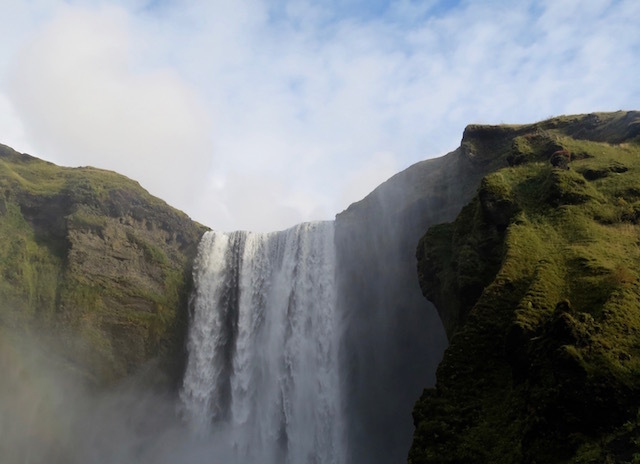 The Skógafoss has its source in the glacier I wrote about in my last post. 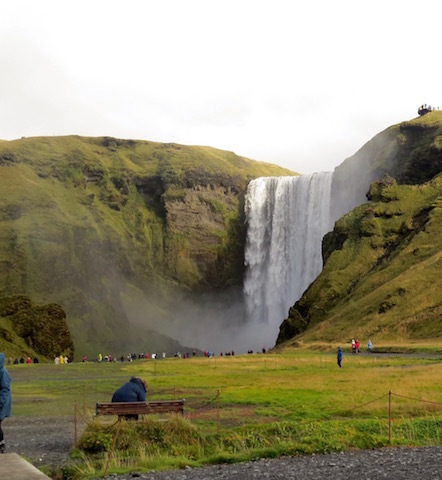 Skógafoss is sixty meters high. 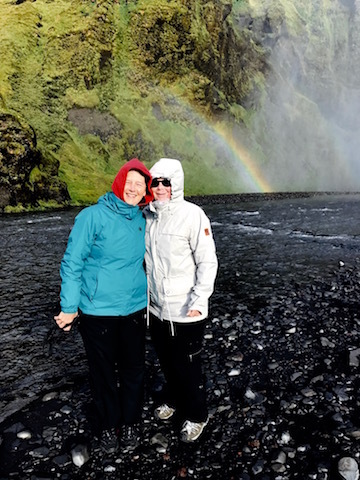 The spray from the waterfall which mists around you as you hike closer consistently produces a rainbow near the base of the falls on sunny days. There is a legend that a treasure was hidden in a cave behind the falls. No one has yet been able to find or retrieve it. Although Dave isn’t always eager to take photos of me he had no trouble agreeing to snap a picture of these two lovely young ladies from Germany. 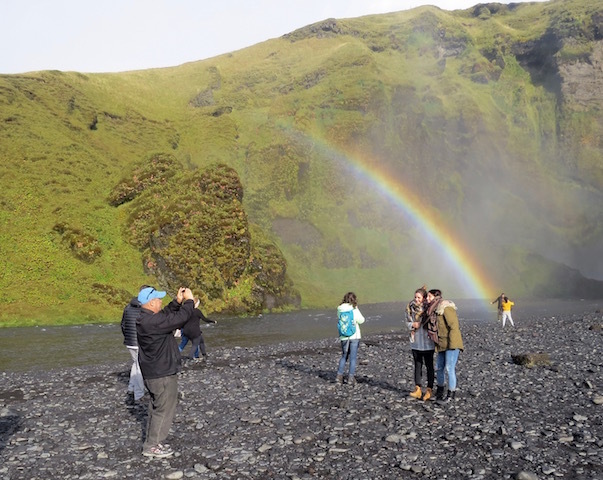 Skógafoss has been used as a backdrop for movies, television programs and music videos and countless posters with inspirational sayings. I saw a young blind man with a white cane being led to the falls holding on to the hand of a woman about his age. It made me close my eyes for a minute and listen to the falls. It was a good reminder that nature’s beauty can be enjoyed with more than just your sense of sight.